Hethersett Mill Road mill had a two storey roundhouse and used patent sails to drive one pair of 4ft and one pai of 4ft 2ins French burr stones, a flour mill and jumper. A Very Superior POST CORN WINDMILL with patent Sails & winding tackle complete, two pair of French burr stones 4 ft. 10 ins. & 4 ft., Flour Mill & Jumper with going gears complete substantial brick built Round House with two floors, a most excellent Dwelling house containing … garden, barn, stables, piggeries etc. etc. The whole are in the very best state of repair being nearly new, standing in about an acre of Land well fenced in. The above is an advantageous opportunity for any person with a small capital, where the Occupier, who is changing his residence has been carrying on a successful Trade. It is most delightfully situated in the Village of Hethersett, within five miles of Norwich, one of the nest Corn Markets in the Kingdom, & altogether one of the most complete situations in the county of Norfolk. All that Capital POST MILL, Flour house, Dwelling house, Barn, Stable, Gardens, Yards & Piece of Land situate at Hethersett near Norwich, lately occupied by John Davy. The Mill has patent sails, roundhouse with two floors, two pair of stones, 4 ft. & 4 ft. 2 ins (drive abreast) flour mill & jumper & is in thorough repair, winds herself & has all her going gear complete. The Dwelling house … & contiguous thereto is a barn, stable, gig house, counting house etc. The Mill in which a considerable business was carried on during the occupation of Mr. Reynolds is well situated for Trade being in a populous neighbourhood. Apply to Messrs. Unthank, Foster & Unthank, Solrs. Queen Street, Mr. Rackham, Solr. St. Giles & to the Auctioneer, Dukes Palace, Norwich. All that superior & valuable Post Windmill at Hethersett in Norfolk lately in the occupation of Mr. John Davy, with the Flour House & other Buildings & Land adjoining (including the Road leading to the Mill) & the scite of the Mill & Buildings containing about One Acre. Also a comfortable Dwelling House … with Barn, Stable, Gig-house, Counting house, Garden, Yard & Land adjoining. The Mill is situated in a populous neighbourhood near the Turnpike Road from Norwich to London & about 5 miles distant from Norwich, drives two pair of Stones (4 ft. & 4 ft.2ins.) abreast, has Patent Sails, Roundhouse with two floors, Flour Mill & Jumper, winds herself & has all going gears complete, is in thorough repair & business to a considerable extent has been carried on in it. The whole is Copyhold of the Manor of Hethersett Cromwells – fine certain 4s. per Acre for Land & 6s.8d. for every building. No outgoings. Deed of Assignment 27 March 1833 for the benefit of Creditors. To be Let and entered upon at lady Day next. A capital Post Windmill, with Patent Sails, two pairs of stones, flour mill, going gears, tackle and machinery complete, in substantial repair and good working order, with sack barrow, weights, scales etc. Also a dwelling house, flour house, barn etc. In the occupation of Mr. Vince, situated in Hethersett, together with four acres of arable land adjoining. A Capital POST WINDMILL with Patent Sails, two pair of Stones, flour mill, going gears, tackle & machinery complete in substantial repair & good working order, with sack barrow, scales, weights etc. Also a good Dwelling house, flour houses, barn, stable, gig house, cart shed & other convenient outbuildings, in the occupation of Mr. Vince, advantageously situated for business at Hethersett within five miles of Norwich; & from one to four acres of excellent Arable Land adjoining. Apply to Rackham & Morse, Solrs. Norwich. All the neat Housejold Furniture, Black Mare & Pony, two fat Pigs, Carts, Gigs & Harness, Sacks, etc. Particulars at Inns in the neighbourhood, Place of Sale, & of the Auctioneer, Hingham. Having declined Business, all persons to whom he stands indebted are requested to send an account of their demands either to him or to me the undersigned James Winter at my Office in St. Giles Broad Street in order that the same may be examined & discharged. And all persons who stand indebted …..
A Convenient Dwelling House, Wind Corn Mill, Barn, Stable, Piggeries, spacious Granary & about 4 ac. of very productive arable land. The Mill has patent sails driving 2 pairs of stones, with Flour Mill, Jumper & all usual machinery & apparatus complete & grinds from 2 to 3 lasts per week. There is a good home trade & the present tenant Mr. John Forrett quits at Michaelmas next. Apply to Mr. Chas. C. Atkins, Land Agent, Coston, Wymondham. Messrs. Butcher have the honor to announce that they are directed by R. W. Blake, Esq. To Sell by Auction in the month of May … A Capital WINDMILL, DWELLING HOUSE, FARM HOUSE, 2 Barns, Stables etc. 4 Cottages & about 14a. 2r. 0p. of Land at Hethersett, near Norwich. Messrs. Butcher are favoured with directions from R. W. Blake Esq. to sell by Auction at the Swan Hotel, Norwich on Saturday 12 June 1858 at 3 o’c in seven lots the undermentioned desirable estates viz. An excellent Dwelling House, also a capital WINDMILL driving two pairs of stones, spacious granary & two pightles of excellent Land containing together 2a. 3r. 8p. in the occupation of ……………. Messrs. Butcher will sell by Auction at the Swan Hotel, Norwich on Saturday August 28, 1858 at 3 for 4 o’c in lots, viz. Apply to Messrs. Rackham & Cooke, Solrs., Messrs. Butcher, Land Agents & Auctioneers, Norwich & 37 Bedford-row, London. An excellent brick built DWELLING HOUSE ... with barn, stables, flour shop & warehouse; & capital WINDMILL with roundhouse, driving two pairs of stones, spacious board & tile granary & two pightles of excellent land adjoining containing together 2a. 3r. 8p. in the occupation of Mr. John Bird, a yearly tenant at the rent of £45. 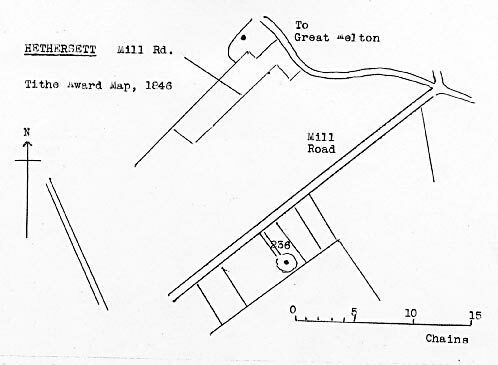 Copyhold of the Manor of Hethersett Cromwells. Fine certain. For further particulars & Price apply to Mr. C. C. Atkins, Land Agent, Coston or Messrs. Rackham & Cooke, Solicitors, St. Giles St. Norwich. Mobbs was then tried on the charge of feloniously embezzling the sum of 11s 8d, the property of his master Wm. Field, miller at Pulham St Mary Magdalen. The prisoner had been six years in Mr Field's employment, and occasionally received money for him. After the prisoner left his employ a few weeks ago, the prosecutor sent a Mr Stanley a bill for 11s 8d for five stone of flour bought on March 15 th, and he then found that Mr Stanley had paid the money at the time to the prisoner, who delivered the flour. The defence was that the prisoner had paid the money to the prosecutor, who had omitted to mark it off in his book, and had consequently forgotten receiving it. Mr Bulwer urged the probability of such a mistake, and the prisoner’s honesty during six years' service, as strong presumptions against the likelihood of his embezzling a paltry sum of 11s 8d. The prisoner was acquitted by the jury. Rachel Rant was the daughter of William Wright. Reading the above report and consulting the timeline below, it would appear that William Wright was the husband of Rachel Wright and that he was living in the same house as his daughter and family in 1861. Interestingly, he did not show up in the census return of 1861, so presumably he was elsewhere on the date of the census. In the Matter of Mr. T. Drane, Miller etc. Sale to commence at 12 o'c precisely. O. D. Ray, Auctioneer, 12 Upper King Street, Norwich. To Millers & others. 5 miles from Norwich. Messrs. Butcher are instructed to Sell by Auction at the Royal Hotel, Norwich on Monday 25 July 1864 at 3 for 4 o'c in 3 lots. Lot 1. A Capital WINDMILL with Roundhouse, Granary, an excellent Dwelling house with 5 Bedrooms, Barn, Stable, Flour Shop & Warehouses & 2a. 3r. 8p. of Land occupied by William Youngman. All Copyhold. Fine certain. Apply to Rackham & Cooke, Solrs. or the Auctioneers, Norwich. Lot 1. A Capital WINDMILL with Roundhouse, Granary, an excellent Dwelling house with 5 Bedrooms, Barn, Stable, Flour Shop & Warehouses & 2a. 3r. 8p. of Land occupied by William Tuttle Drane. All Copyhold. Fine certain. Rachel Lant appears to be the widow of John Timothy Lant (m.1858 Sep Qtr; d.12 Mar 1861 Hethersett) having been previously m. 849 Jun Qtr to Frederick Crane; William Lant senior I believe to be her father whose name should be Wright, while William Lant was born a Crane. John Lant (deceased) would appear to be the son of Joseph Lant miller in Tibenham in 1851, and he, or his father also Joseph, is mentioned in your pages under Forncett. Rachel doesn't seem to have married again as the Rachel Lant d. 1924 Nov Qtr age 92 is probably her. Rachel is living next door to the Mill House in Tasburgh in 1881, no occuption given. Coincidence, or using the mill network to find somewhere to live? Anyway my conclusion is that a Lant was miller in Hethersett for a short while.